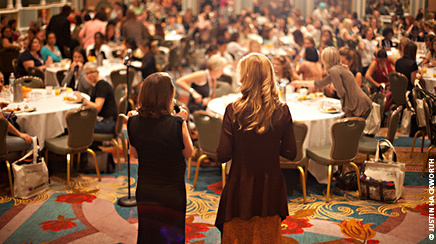 More brands are recognizing the importance of the BlogHer conference, a pivotal yearly meeting that attracts key women influencers from across the online space. Sara Lee is back this year – one of 100 sponsors at the four-day BlogHer event in San Diego through August 7. Elisa Camahort Page, COO and co-founder of BlogHer, said 3,600 attendees are expected, up from 2,400 last year (and just 300 when it launched in 2005). In fact, the annual conference has become the largest of its kind, and not just for women in social media, but for social media in general. Camahort Page credits the recognition among corporate America that women control household spending and use the Internet to talk about almost every aspect of their lives. Matheu agrees, which is why Sara Lee is using the event as a springboard for two initiatives. The first introduces a new campaign for Hillshire Farm, “So Good. They'll Think It's for Them,” and includes a pop-up eatery on the BlogHer expo floor where attendees can sample new product offerings and meet campaign spokeswoman Wendi McLendon-Covey, co-star of the movie "Bridesmaids." For its Jimmy Dean brand, Sara Lee is launching a cause marketing partnership with Share Our Strength's No Kid Hungry Campaign, which aims to end childhood hunger in the US by 2015. MWW Group is providing PR support in collaboration with Sara Lee's event marketing agency, Escalate. In addition to Sara Lee, BlogHer's largest sponsors this year are HTC, Ford, Procter & Gamble and PepsiCo, the latter of which has expanded its outreach. So, too, has P&G; in its first year as sponsor, it only showcased its fabric care products. P&G is the sponsor of the Life Well Lived Day on August 5, a pre-conference event to help women find more balance in their lives. Using its beauty brands Pantene, CoverGirl, and Olay, P&G is pampering bloggers poolside at the hotel through services like blow-outs and leg messages. Virtually all of its PR agencies are involved in the BlogHer effort, McCracken said. New BlogHer partners include Ford, the sponsor of the event's first-ever family picnic on August 7. The picnic is catered and invites attendees to test drive Ford vehicles on-site. Ford is working on the event with WPP partners Ogilvy 360 and Direct Impact.